Operator: United Baltic Corporation Ltd, London. Built 1953 by Werft Nobiskrug, Rendsburg, West Germany. Yard no 564. Propulsion: 2 x 10-cylinder, four-stroke MaK 10MZU581A of 3,600 bp (total). Speed: 15.5 knots. 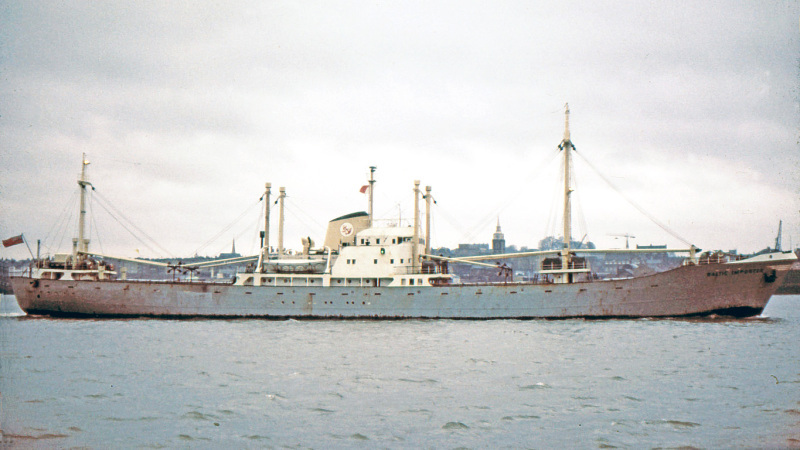 1969-SILVER SWAN (Somali flag); 1970-SOUTHERN DRAGON; 1973-EXPERT MARU (Panama flag); 1973-SHINTOKO MARU; 1975-GLORY STAR; 1978-WAH PO; 1978-RITA POINT; 1979- WELL VOY No 1. 1993-deleted from registers, presumed scrapped. This photo has been shown 385 times since it was added to the site.